Jacqueline M. Handorf-Rugani knew from the time she was very young she wanted to be a lawyer. She began developing her skills at the family dinner table where everyone was encouraged to engage in discussion and debate. In school, she often found herself standing up for kids who were bullied or picked on. After graduating with a degree in History from The Ohio State University, Jackie pursued her passion for the law and attended Salmon P. Chase College of Law. 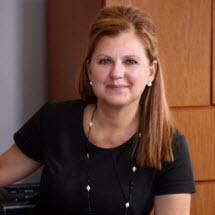 She began practicing in 1992 and has spent the majority of her career handling Family Law Matters. She is a former Assistant Prosecutor for the Warren County Child Support Enforcement Agency and a former Acting Judge for Warren County Court. Currently, Jackie serves as a Civil Magistrate in Lebanon Municipal Court. Jackie’s experience on the bench gives her unique insight in preparing her private practice matters for trial. Jackie strives to provide representation tailored to fit the needs of each individual client. It is her goal to move your family forward.